Features 16.4' maximum length, 4 sections, Sprinter barcode, measurement in feet/10ths/100ths, circular bubble, and carrying case. Its high-quality anodized aluminum construction resists fading and weathering. Its lightweight construction makes it easy to transport and set up, while its strength and precision makes it suitable for industrial applications. 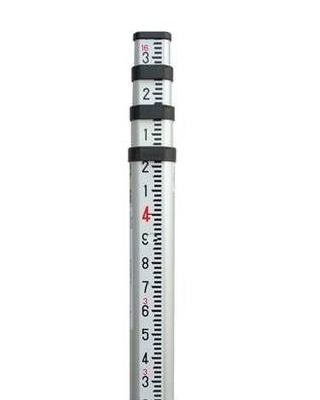 To use this graduated staff to measure height, hold the staff vertical. The staff starts at zero, on the ground. Every mark on the staff represents a unit of measure, either a major graduation (feet in large red numbers) or a minor graduation (tenths of feet in small black numbers, or hundredths of feet in numberless marks). To optically read the staff, look through the eyepiece of the telescope of your Leica electronic level and take the number shown below the reticle on the graduated (numbered) side of the staff. Count the number of whole increments between the whole number and the reticle. Then estimate the number of increments between the last whole unit block and the center of the reticle. To electronically read the staff, turn the staff so the side with the bar code faces the electronic level. The height of the staff where the level beam crosses the staff is shown on a digital display. This method removes interpolation of graduation by a person, thus removing a source of error and increasing accuracy. Compatible with all Leica Sprinter electronic levels.